When I lived in Tokyo I would usually pick up breakfast on my way to uni. If there is one thing I miss the most about Japan it is the convenience stores, or conbini, they were just brilliant! You want a kitkat, a bottle of mikan juice and a bowl of hot macaroni cheese at 3am? Done! Japanese food was just amazing in all ways, even the rubbish, but I digress. Every morning for a good few months I would stop off at a particular store on my trip to uni and I would buy myself a carton of cafe latte and a cheesecake bar. It was just a simple stick of baked cheesecake. No biscuit, no flavouring, just cheesecake plain and simple. For Christmas I got a silicone baking mould that forms 12 bars. I had asked for a 9 hole mini loaf tray but such a creature does not exist it would seem and the closest “Mother Christmas” could come was a 12 hole bar tray from France. The first thing I thought of when I saw this tray was, “Well that’d make funny shaped loaves.”, the second thing I thought was, “But I could make cheesecake bars!” And so last night, when I was in serious need of some baking therapy having just watched Doctor Who, I did. 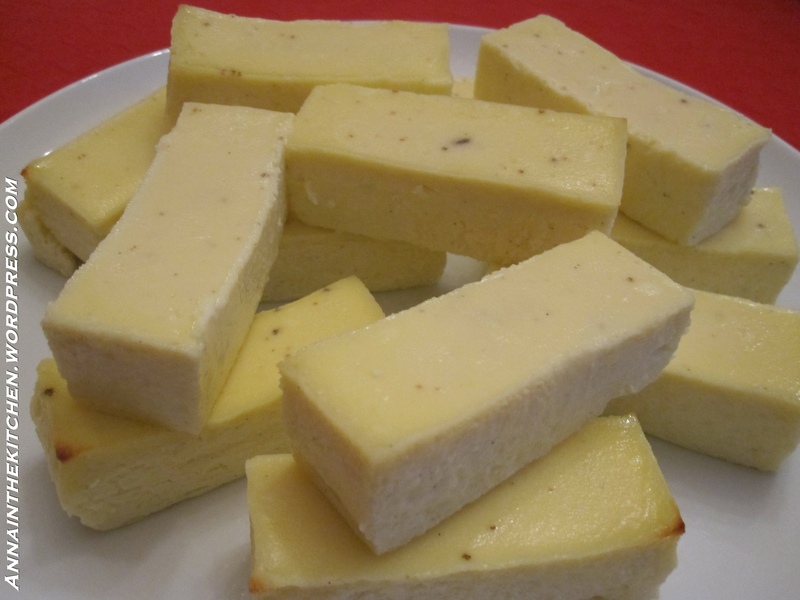 This cheesecake recipe is the simplest thing in the world only 5 ingredients! I think I first saw this recipe in a supermarket magazine as a project for kids but it is now one of my emergency recipes as it takes so few ingredients. I like to make it after dinner because then you can just leave it and forget about it while it cools in the oven overnight and it’s not taking any time away from other things. Also you get to breakfast on cheesecake and what’s better than that? Makes 12 bars. If you don’t have a fancy mould like mine then you could probably just use a brownie or square cake tin and cut it up. – Preheat the oven to gas mark 4 and grease your mould, tin or tray with melted butter. 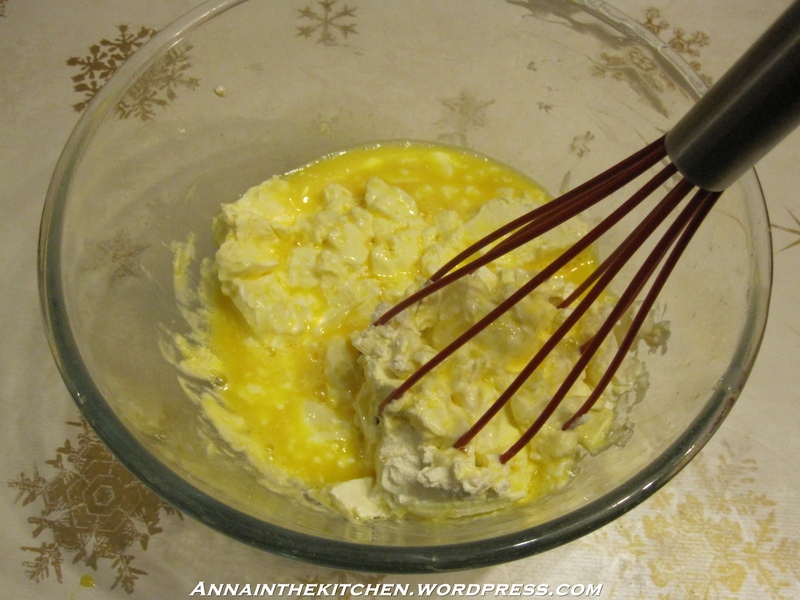 – In a medium sized mixing bowl beat the eggs. – Add the cream cheese and beat until smooth. ...and it will look like this! 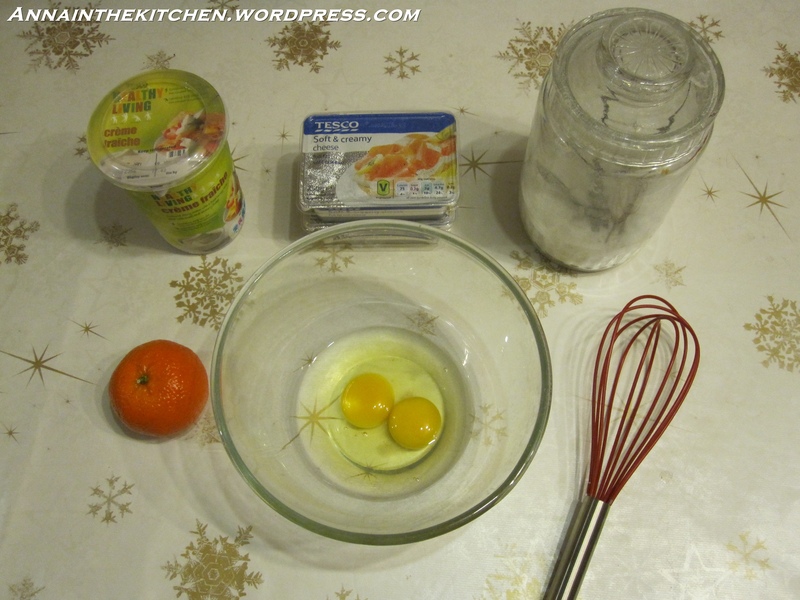 – Add the sugar, vanillas and creme fraiche and beat until well combined. – Pour into your chosen mould and bake for 30 minutes. – Turn off the oven and leave overnight or until completely cool. – Turn out, and slice if necessary, and serve! We eat these a fair bit in our family and now I have proved that they make a decent party food. Not the most graceful of foods to eat I’ll admit but so long as your not too precious about it and just get stuck in it’s a great food! – Put the chicken, onion, chilli, corriander and lime juice in a bowl and set aside to marinate for at least 1 hour, preferably longer. – Add the marinated mixture, if a lot of liquid in the bottom of the bowl leave this out. 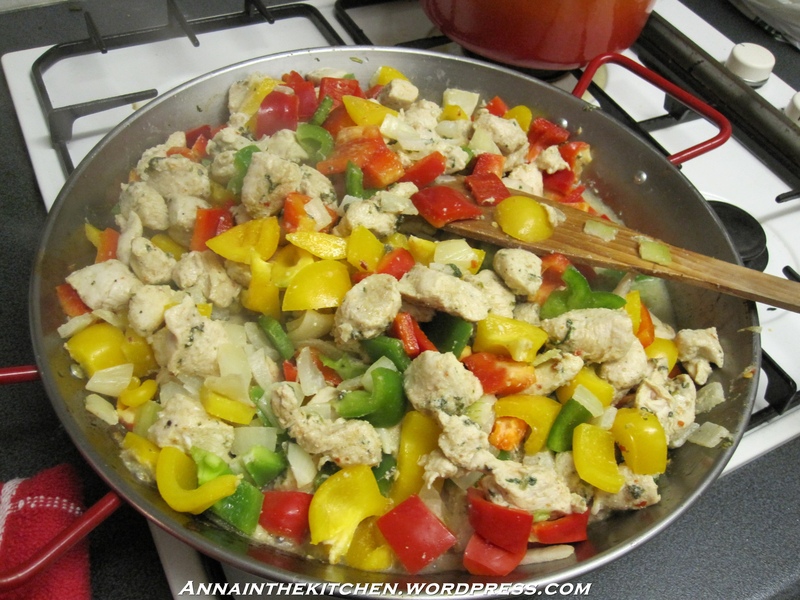 – Cook, stirring regularly until the chicken is cooked then add the peppers and the reserved juice. 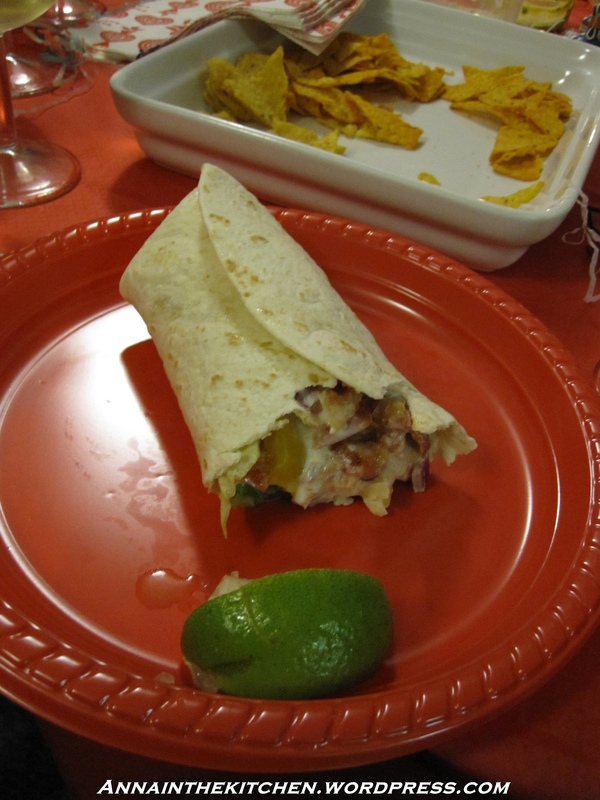 – Microwave your tortilla wraps as you need them for about 30 seconds (1minute for a whole pack). – Make up the wraps as you like. 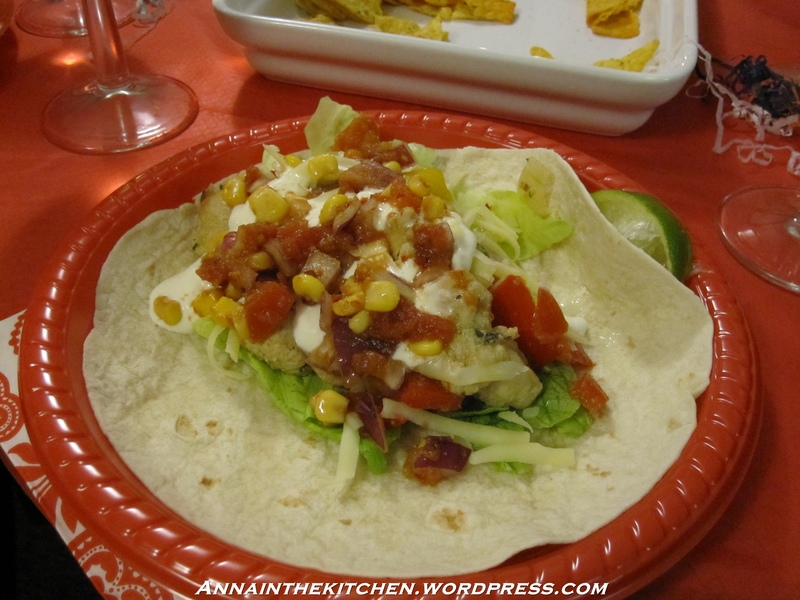 Standard order is lettuce, fajita mix, salsa and creme fraiche then squeeze lime juice on top. The best way to fold them is to place the filling along the centre but only go 2/3 along. Then fold up the remaining 1/3 over the filling and wrap the two sides over the top. Then eat! It makes a handy little pouch so you’re not dropping stuff all over yourself… well, if you’re careful! At least I think that’s what the recipe called it. I kept the name but altered the recipe a fair bit. The idea of it was basically summery flavours in the depths of winter but these days that’s not so odd I guess! Who knows what you call it in the summer! It made a delicious dinner anyway and only took about 30 minutes to make. It even kept warm very well as dinner was delayed by another 30 minutes. I had everything ready by 8pm then kept the pasta covered with a tea towel in a warm oven and reheated the sauce and put it together when everyone was there. – Heat a little oil in a large frying pan and cook the chicken until just browned. – Get your pasta going. – Push the chicken to one side and add the garlic, fry in the space for a minute then stir through the chicken. 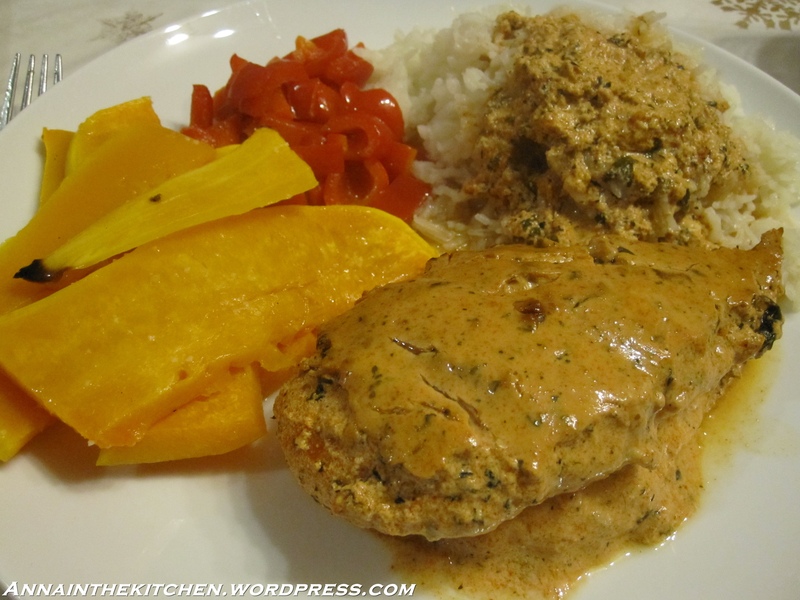 – Add the halved tomatoes and cook for one minute. – Add the soft cheese, creme fraiche, hard cheese and parmesan. – Stir until combined. If it seems a little thick add a little water from the pasta. – Grill the tomato slices until just starting to blacken in places. 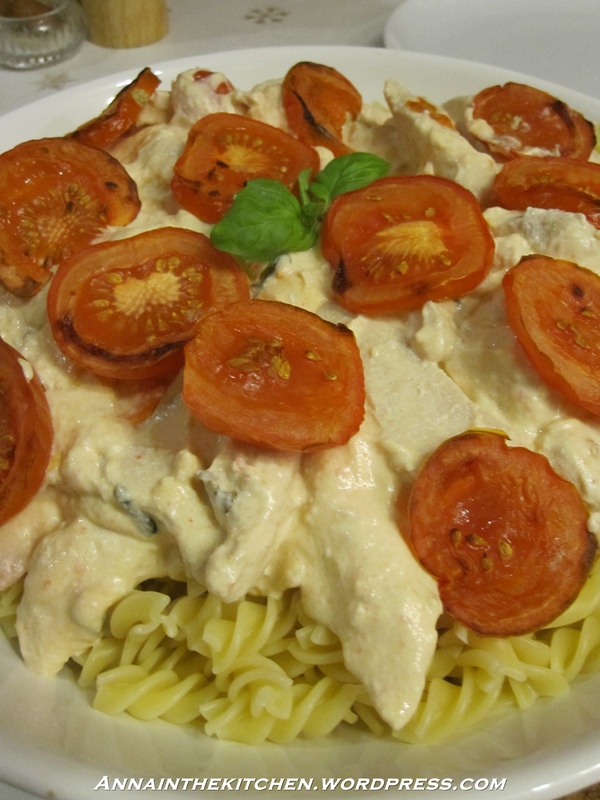 – Serve on top of pasta garnishing with the sliced tomatoes. I’m in a very autumnal frame of mind at the minute. I’m home alone this week so I’m not so keen on the howling wind and getting dark early part but I do love walking through the leaves and huddling up inside in the warm. I find that although I’m happy to eat sandwiches for lunch throughout the summer come autumn I feel the need for soup. The warmth you can gain from a bowl of soup and lovely buttery bread is better than the central heating sometimes! I’ve usually been a Heinz fan but this autumn I’m really enjoying making my own soups. The latest one is this Spicy Butternut Squash Soup. It’s not actually what I would call spicy, the chilli comes as a lovely wash of heat over your tongue and complements the mellowness of the butternut wonderfully. Plus I like the colour! – Place in a roasting tin and toss in a little olive oil. – Roast in the oven for 30 minutes. – In the meantime prep your onions, garlic and chilli then put it all in a large pan with a knob of butter and a splash of oil. – Keep on a very low heat for about 20 minutes until the onions are completely soft. – Take the squash out of the oven and tip into the pan. 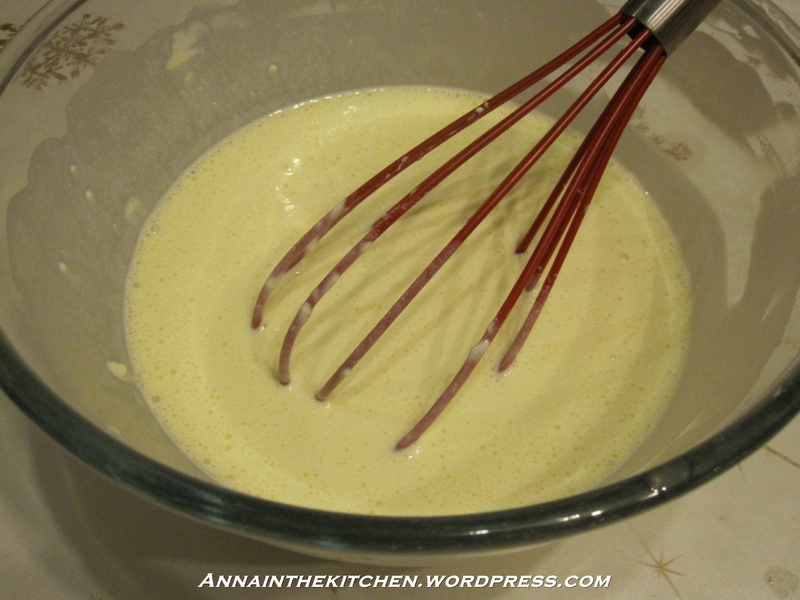 – Add the stock and creme fraiche and stir a little to start mixing it. – Then take a hand blender and blend the soup until smooth. – Reheat it when you’re ready to serve.